A true candle lover will know that there’s so much more to a great candle than just the scent; it’s about wicks, the wax, the packaging, how they burn, how the smell when they’re burning and so much more. Knowing that, we thought it would be fun to interview the geniuses that make candles, the ones that feed our addiction and make our homes smell amazing and feel ever so warm and inviting. I’d like to introduce the ever so kind and sweet Lyn from My Dearly Loved. 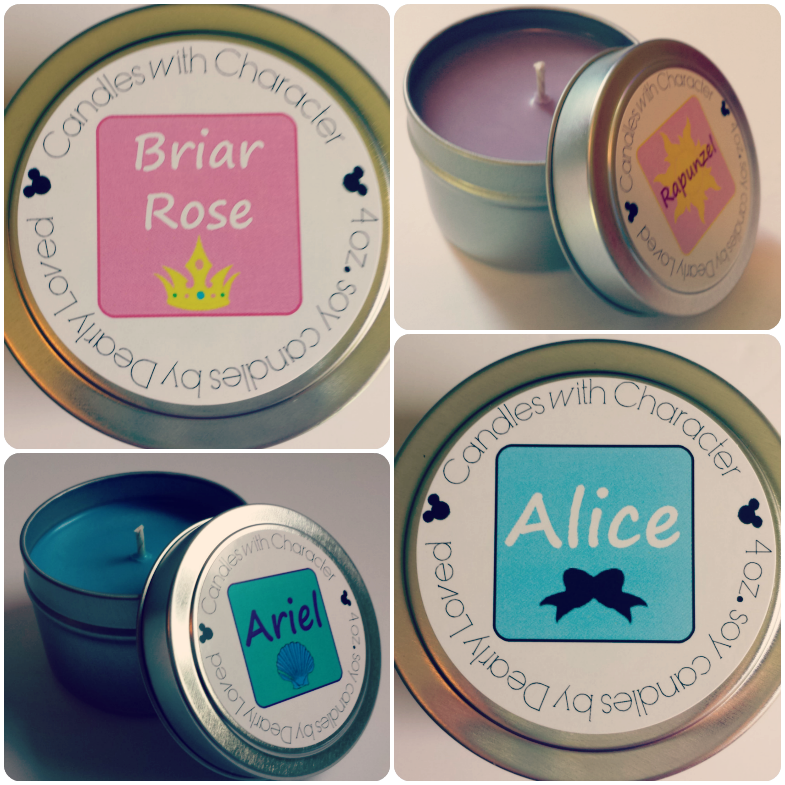 Lyn makes Disney inspired candles and other goodies. That’s right, Disney Candles?! How amazing is that? Two of the greatest things in the world combined! Briar Rose, Rapunzel, Ariel and Alice. So Lyn, tell us a little about yourself – what originally drew you to making candles and launching your own business? Simply put, Dearly Loved began as a coping mechanism. It would be putting it mildly to say I went a bit overboard planning a once-in-a-lifetime trip to Walt Disney World where nineteen family members travelled to celebrate my parents’ 40th wedding anniversary just last year. Upon our return, Dearly Loved was born in order for me not to succumb to full blown PDD (Post Disney Depression). I was able to channel all of my creativity, from close to a year’s worth of planning for WDW, into my business. I’m sure you’ve heard this before, but when you’re working in your passion it doesn’t feel like “work”. This couldn’t be truer for me, as I’m currently celebrating the one year anniversary of Dearly Loved. Whenever I go on vacation, often times to Disney, I enjoy bringing along candles. 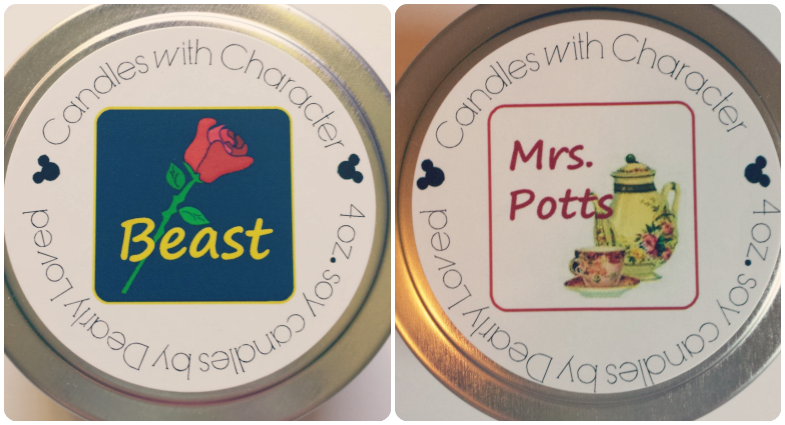 I created my Disney-inspired, Candles with Character line to be convenient for tossing in your suitcase. Since all of my candles are in tins, you don’t have to worry about breaking glass, in addition to the added weight of glass jars when you’re on the go. After you’ve enjoyed your favourite scent, just pop the lid back onto your tin before heading home. Tell us about the process that goes into making your lovely candles? What wax/products do you use? I think what I’d like most for you to know about my candles is that they are completely handmade. From the design of each label, to the setting of each wick, to the pouring of each candle…it’s all me! I use 100% soy wax for all of my candles. The wicks I use are cotton braided with paper threads for stability in burning, specific to the size of candle I’m making. I use footed tins, so that burning surfaces remain cooler. From beginning to end, I put a lot of thought into the type and quality of all of the products I use to create my Candles with Character. What’s your inspiration for coming up with new scents? I come from a long line of Disney fanatics. My mom was born the same year Disneyland originally opened, in 1955. I’ve been on more trips to The Happiest Place on Earth than I can count. I have a never ending treasure trove of personal experiences and memories, from visiting the parks, to watching Disney films, which I can pull from when creating my candles. The creative process of envisioning what a character, attraction, or meal would smell like is the best part of coming up with a new candle. Trading Post and Character Breakfast are two good examples. 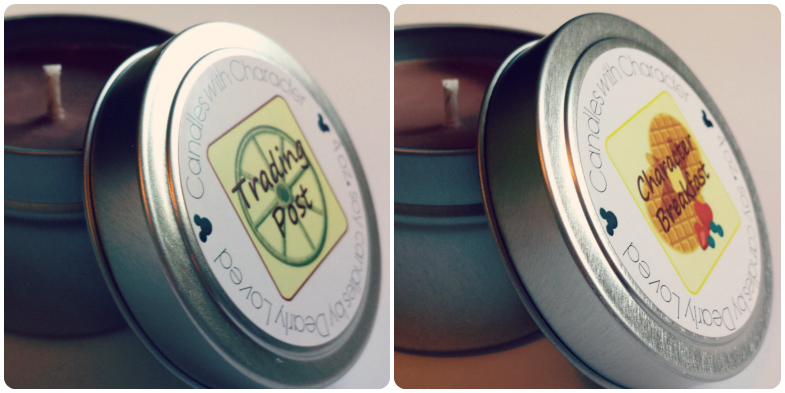 With my Trading Post candle, I vividly remember me and my sister standing on the wooden porch in Frontierland, breathing in the smell from the leather goods store. I’m instantly a little girl with pigtails whenever I smell this candle. There’s nothing I love more than a great meal on a Disney vacation. Character Breakfast is so much fun because some of my favourite memories of my own children meeting the characters happened during these special times. This candle has layers of Mickey waffles covered with buttery syrup, fresh cut fruit, and just a touch of bacon…yum! What is your favourite candle scent of all the candles you make? The candle I’m most proud of, and worked the hardest in creating, is my Pirates of the Caribbean candle. This is arguably the most beloved Disney attraction, and I wanted to create a candle that paid tribute to the scents you encounter on the ride. There’s no other candle like it, and it is one of my top sellers. Are there any scent combinations you’ve tried that have turned into a total disaster? What about happy accidents? I tried to come up with a Heimlich candle from ‘a bug’s life’ and both the scent I chose and colour combination was horrible. So he’s still a work in progress. I’ve also wanted to create a Merida candle. To me, she would have a spruce scent…something outdoorsy. Unfortunately the oil I originally chose didn’t have a strong enough cold or hot throw. The “accidents” I love the most are when a colour blend comes out better than I’d imagined. My Princess Tiana and Mulan candles are good examples of this. Because of the work that I do, I’m especially interested in local, handmade shops. A Glowing Trend is a small, Arizona based candle and soap company whose products are fabulous. Their blackberry sage candle is divine! 1) Bible – I don’t leave home without it! 2) My mom – if an “item” can include a person, then she’s definitely coming with me on this adventure. 3) Tent – I’m a fantastic planner and I’d find the biggest and best out there. 4) Bikini – I’ve never been able to wear one, and that’s okay, but if I’m stranded I might finally be lean and mean enough to pull this off! 5) Candles with Character – Since one of the items has to be one that I sell, I’m choosing my candles…along with matches, of course. So practical. Have you any new and exciting creations planned that you’d like to share with us? There’s so much to Dearly Loved. I’m constantly working on new articles, Dearly Diary videos, Dearly Devotions and new products for my shop. The great thing about my Candles with Character line is that there’s always something new that inspires me, and that is what I enjoy most – the creativity. I’m also currently working on a couple of fun, Disney-inspired maternity t-shirts, as well as Hidden Scripture scarves that I’m looking forward to introducing in the very near future. Stay tuned for a review of Candles With Character and if you’re a candle maker and would like to be featured in our new series please contact us at 2girls@vanillaandlime.com. Thank you so much for this FUN opportunity! You made the interview process SO enjoyable, and I’m just bursting with excitement to see how this all came together! Looking forward to my Candles with Character review….much love! So glad you like it and your answers are just wonderful! Thanks for the shout out and the kind words. We look forward to seeing you at some shows in the fall. Best of luck to you. Go handcrafters! Chris, this just made me smile!